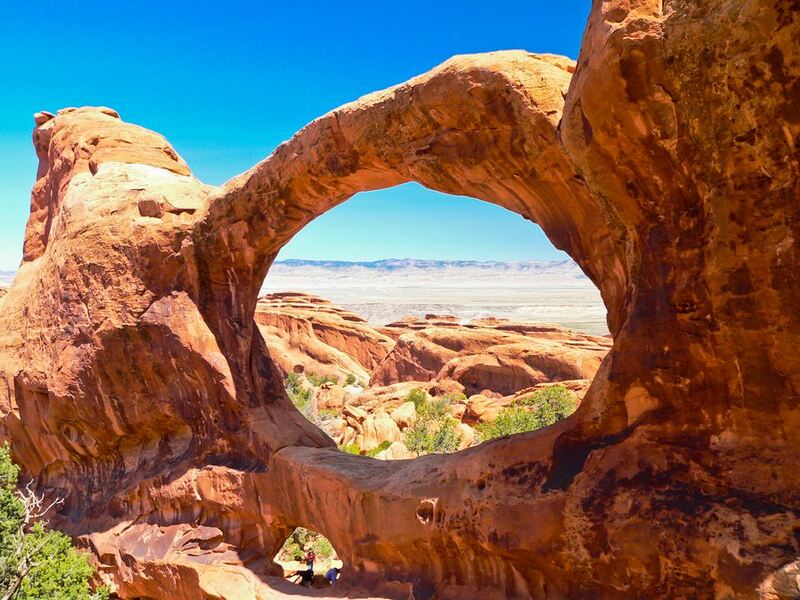 It's no surprise how Arches National Park got its name. With over 2,000 natural arches, giant balanced rocks, pinnacles, and slickrock domes, Arches is truly spectacular. Located high above the Colorado River, the park is part of southern Utah's canyon country. Millions of years of erosion and weathering are responsible for the most beautiful natural wonders you could imagine. And they are still changing! In April 2008, the famous Wall Arch collapsed proving that all arches will eventually succumb to erosion and gravity. Before any mountain bikers came to Arches, hunter-gatherers migrated into the area about 10,000 years ago at the end of the Ice Age. About two thousand years ago, the nomadic hunters and gatherers began settling into the Four Corners region. Known as the ancestral Puebloan and Fremont people, they raised maize, beans, and squash, and lived in villages like those preserved at Mesa Verde National Park. Although no dwellings have been found in Arches, rock inscriptions and petroglyphs have been found. On April 12, 1929 President Herbert Hoover signed legislation creating Arches National Monument which wasn't recognized as a national park until November 12, 1971. The park is open year-round but remains most popular to tourists during spring and fall as temperatures are great for hiking. If you are looking to see wildflowers, plan a trip during April or May. And if you can stand the cold, visit Arches during winter for a rare and beautiful site. The snow sparkles magnificently on the red sandstone! From Moab, drive on US 191 north for 5 miles until you see the park's entrance. If you are coming from I-70, take exit Crescent Junction and follow US 191 for 25 miles until you reach the entrance. All national park and federal land passes are accepted in the park. For individuals visiting via motorcycle, bicycle, or by foot, a $5 entrance fee applies and is good for one week. Vehicles must pay $10 for a one-week pass which includes all occupants of the vehicle. Another option is purchasing the Local Passport. This pass is good for one year and allows entrance to Arches, Canyonlands, Hovenweep, and Natural Bridges. Delicate Arch: This arch has become the symbol of the park and is remains the most iconic and recognizable. Fiery Furnace: This section is almost maze-like with narrow passages and giant rock columns. The Windows: Just as it sounds, the Windows contain two arches - the larger North Window and the slightly smaller South Window. When viewed together, they are known as the Spectacles. Balanced Rock: You can't help but feel tiny next to a giant balancing rock that's the size of three school buses. Skyline Arch: In 1940, a giant mass of rock broke from the arch doubling the size of the opening to 45 by 69 feet. Double Arch: Check out two arches that share a common end for a stunning sight. Although Arches does not permit backcountry camping within the park, the Devils Garden Campground is located 18 miles from the park entrance and is open year-round. The campground has no showers but does include picnic areas, flush toilets, grills, and potable water. Reservations may be made by calling 435-719-2299. Manti-La Sal National Forest: The Moab District of the forest is only about 5 miles from Arches, while the Monticello District borders Canyonlands National Park. The forest is full of stunning mountains draped with pine, aspen, fir, and spruce. Visitors can find much to do in Dark Canyon Wilderness, 1,265,254 acres offering areas for hiking, climbing, horseback riding, fishing, camping, and fishing. Open year-round, more information is available by calling 435-259-7155. Canyonlands National Park: Though a slightly less-traveled park, Canyonlands offers visitors three very distinct and stunning districts to visit. The Island in the Sky, the Needles, and the Maze range from striped pinnacles to untouched solitude. Enjoy camping, nature walks, hiking, mountain biking, river-running trips, and overnight backpacking. The park is open year-round and may be reached at 435-719-2313. Colorado National Monument: Tour this monument's beautiful canyon walls and sandstone monoliths on the 23-mile-long Rim Rock Drive. Trails are well-maintained and perfect for hiking, biking, climbing, and horseback riding. Open year-round, the monument offers 80 campsites and is located about 100 miles from Arches.